Henry is a very talented teenager who had an accident in 2009 whilst on holiday with his friends. He ran into the sea, dived into the surf and damaged his spinal cord leaving him unable to move his arms and legs. Henry is a superb athlete with a particular passion for rugby. He was a regular member of Dulwich College 1st XV and has represented the County, London & South East Division and Saracens Academy. He is still training and still has lots of goals to achieve – just different to the ones he had before. 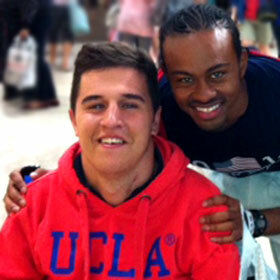 Matt visited Henry shortly after his accident and has become good friends with him over the past couple of years. The Saracens Rugby Club have shown fantastic support to Henry since his accident, this is no surprise as their owner Nigel Wray and the Club's supporters have been so supportive to Matt since his own accident in 2005. Matt has been using a piece of equipment, Easystand's Evolv, for the past couple of years as part of his rehabilitation and physio and he felt the same bit of kit would be useful to Henry. Henry has now become a successful mouth-artist who commissions pieces as well as holding his own exhibition. Famous personalities such as J.K Rowling, Rory McIlroy and Usain Bolt have all contacted Henry and appreciated his work. In Autumn 2017, Henry published his first book, the Little Big Things. The book recounts Henry's life from his injury to becoming a successful mouth-artist and how every day can be a good day.